Not long ago, the path from part drawing to reliable quote was quite intensive; tying up highly paid top technical staff for work that most likely would never bring a contract. Going the distance—turning that quote into workable production tooling —often was a lengthy and difficult task. That meant high costs and wasteful trial and error as tools entered the press and, until the tooling was perfected, scrap came out. Today, the market provides software that runs the gamut—from simplified programs that assist non-engineers with supplying timely quotes, to entire software suites with powerful solvers. 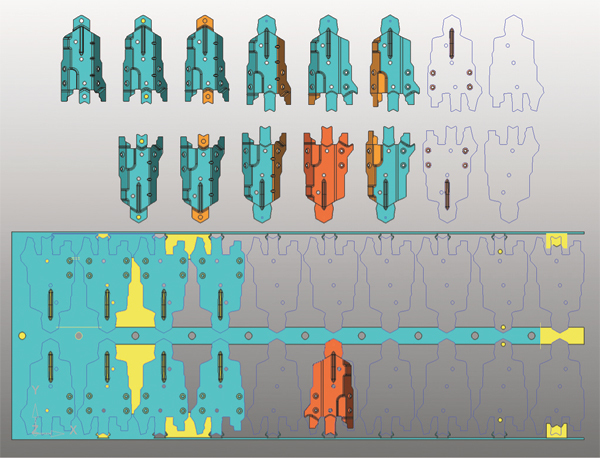 These programs not only churn out accurate quotes in short order, but also carry the brains and number-crunching brawn to simulate forming and build ideal tooling. We spoke recently with experts from three such software providers, who shared technical details with attendees at the recent Die Design and Simulation Software Experience, a MetalForming magazine event held May 30-31 in Detroit. We’ve also tapped the expertise of Pete Ulintz, author of the monthly MetalForming Tooling By Design column. Here are their takes on recent software advancements and their impact on metalformers. State-of-the-art design software can greatly ease the quoting process, calculating cost estimates and generating professional-looking quotes quickly to free personnel to work on current contracts. Photo courtesy of Cimatron. Die design and simulation software bundles into an integrated package that includes modules for quoting, strip layout, die build and CNC programming, allowing users to employ the software from bid through part production. Or, individual modules can be used to augment whatever a designer/ builder already has in place. In addition, you can find software that provides some 3D CAD power to allow nontechnical employees to assist with quoting and project management, or at least determine the status of a quote or job. The point is, whatever is needed for any portion of the process—from simply eyeing a 3D part file to designing the tooling and delivering a working tool—software suppliers have you covered. Of course, expect to pay more for greater capabilities, and be sure to do the research before buying. Not only have software providers developed products to produce more-accurate quotes more quickly, but the software can be accessed and understood by nontechnical folks like sales personnel and management. That allows a team approach to quoting and a reduction in the bottleneck created when only one or two staff engineers can develop quotes. Software databases have improved as well, allowing for lessons learned from previous quotes and the ability to reuse similar existing data for new quotes. “The software provides accurate data upon completion of a quote, so future quotations can be completed more accurately, with less guessing,” says Jeff Jaje, marketing and business development manager for Sescoi USA Inc., Southfield, MI (www.sescoi.com). “More people have access to the software due to its ease of use, allowing more input for the quote. We want the shop owner and the finance people to be able to use it, as well as the people in the shop. Software reveals each operation’s impact on the strip. Photo courtesy of Cimatron. 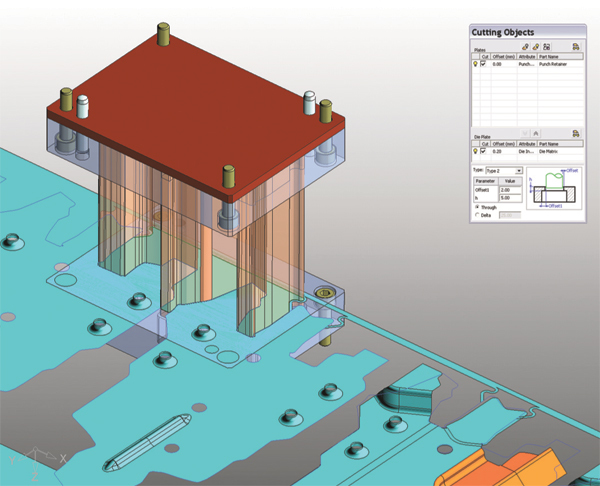 As the simplified quoting capability shows, no longer is the realm of design and simulation software inhabited only by advanced-degree engineers. Software providers have worked hard to make their products usable by more customer employees. Though training is a must, software providers have crafted products to allow at least basic use right out of the box. More and more, die design and simulation software, especially in a full suite of modules, seamlessly traverses the quote, design and build path. Software providers offer a brief look at how their products typically function. This screenshot from Cimatron software shows how, in one mouse click, trimming punches can be designed by defining contours. The software automatically cuts through plates with predefined offsets to position the punch. Sescoi’s WorkXPlore 3D full-featured high-speed 3D CAD viewer and analyzer is designed for users who are not CAD experts. The product allows these users to explore any type of 2D/3D CAD file. WorkXPlore proves ideal when users need to view 3D parts to assist with quoting; compare engineering changes in CAD data; check draft angles and various radii on a part; place notes on 3D part files and share the notes with others who have different CAD software. WorkXPlore functions as a standalone product or as an optional module in Sescoi’s WorkPlan, a family of manufacturing-software products for tasks from project management to enterprise resource planning (ERP) and designed for small to mid-sized manufacturers. WorkPlan enables such manufacturers to automate and manage processes such as job costing, quotations, sales-order processing, planning, quality, time, purchasing and stock management. WorkPlan products include MyWorkPlan for project or job management and WorkPlan Enterprise, which provides full ERP functions. Sescoi also offers WorkNC, CAM software for two- to five-axis CNC machining, as well as WorkNC-CAD. Sescoi’s WorkPlan is described by Jaje as an ERP product for job shops, with WorkPlan used to plan the die design. “When quoting, instead of creating quotes from scratch, our customers may use previous similar quotes in WorkPlan as templates,” he says. “They want to look at part data, so they will use our WorkXPlore 3D viewer. A full CAD system is not needed to estimate for a quote. In WorkXPlore, a user can look at the model and take measurements for radii, for example, and determine that four or five tools are needed to make details and the part. Work-XPlore provides for basic manufacturing analysis related to curvature, draft angle, flats and verticals, etc., to determine part manufacturability. This software does not perform finite element analysis (FEA), but can read any CAD format and from that, manufacturability can be obtained and dropped into MyWorkPlan to determine materials and such, and prepare a quote. ETA offers its Dynaform package as a complete die-system-simulation solution, allowing die providers to bypass soft tooling, reduce tryout time, lower costs, increase productivity and provide confidence in die-system design, according to company officials. The Dynaform interface guides the engineer through cost estimation, quoting, die-face design and formability analysis. Then, in a virtual environment, the software moves the part through the stamping process inside the plant—station by station—simulating trimming and scrap removal, and analyzing die structural integrity. Also, it evaluates the part-transfer process within the die and even simulates behavior of the part during shipping. This forming-limit diagram describes stress on a blank during the stamping process. Photo courtesy of Engineering Technology Associates. Dynaform runs with the LS-Dyna solver, offering calculation power to support difficult modeling and simulation challenges within a die system, according to company officials. With Dynaform, users reportedly can create reliable and accurate quotes quickly. Package modules include Blank Size Engineering, Die Face Engineering, Formability Simulation and Die System Analysis. With ETA’s Dynaform, the process starts with a CAD part model. Dynamic Metals, Inc., Clinton Township, MI, has produced low-volume custom stampings and prototype parts since 2005, all the while employing ETA’s Dynaform for quoting, forming simulation, and tool design and build. The company, with 25 employees, is a Tier One supplier to a who’s who of OEMs, including General Motors, Bobcat and Navistar, and is a Tier Two supplier to Ford and Chrysler. As such, it’s often involved in early die-development and soft-tool production. Equipment on the Dynamic Metals roster includes laser cutters and welders, CNC machines and hydraulic and mechanical stamping presses from 75 to 1000 tons. The company builds some hard tooling, and produces soft tooling to mimic potential production tooling. Dynamic Metals produces parts from difficult-to-form materials such as advanced high-strength steels and aluminum. Newman considers his business a pioneer in employing a CAD-driven process to proceed from CAD part to finished parts, while integrating CAD, CNC and actual part production. With the software, Newman says his company has reduced overall operating costs, capital investment and tryout time—from as much as two weeks to one day. “We can model everything on the computer so that nothing hits the shop floor until it is a good product,” he says. “The software allows us to produce the same quantity with half of the equipment, and we free-up manpower for other uses. We don’t have to change tools anymore, as everything works right out of the gate. The software, based on our experience, achieves 99 percent accuracy." Newman provides examples of benefits brought by Dynaform, including development of an A-pillar rocker-panel extension made from dual-phase 780 steel. “Our customer brought us the part file, questioning whether it was even buildable,” says Newman. Dynamic Metals designed a draw die in CAD and fed it into Dynaform. The result: gross failure. Typically, says Newman, development would be a three- to six-month affair, including tool construction and physical tryout. But with Dynaform, Dynamic Metals was able to develop the tooling in three to four weeks, then take the tooling to the press and stamp the part that its customer thought was unbuildable. 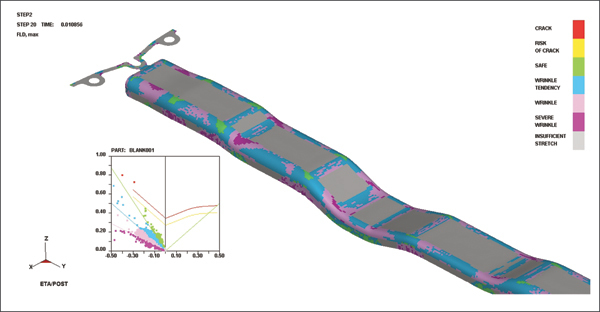 Another example of the software’s capabilities becomes evident when examining Dynamic Metals’ production of oilpan tooling and parts, which typically requires difficult draws. The firm recently received such a part that a competitor had analyzed using competing software that indicated a successful part. In reality, the draw proved too difficult. Lastly, Newman explains how the software also assists with scheduling. Cimatron provides the CimatronE integrated product for die design and manufacturing, while also providing CimatronE modules for standalone use. Modules include CimatronE Die Quote, dubbed ‘a CAD-to-cost solution’ by the company, which calculates cost estimates and generates job quotes. Die-design tools in CimatronE allow users to visualize the part model, create its blank, and perform FEA to clearly understand part formability and job complexity. By performing nesting, users can achieve a price-optimized strip layout, determining progression distance (pitch), strip width, blank location and angle, and the number of progressions. 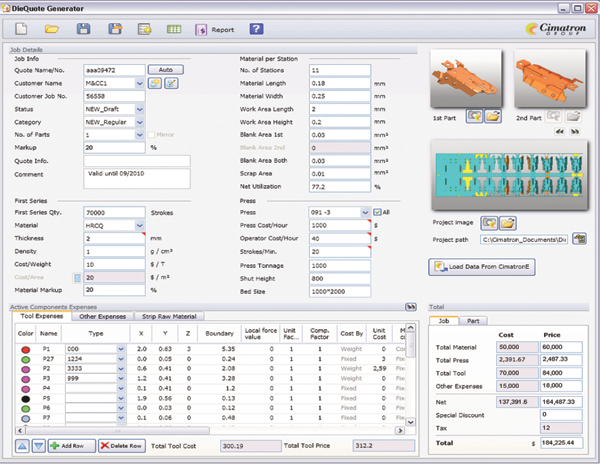 Force-analysis tools enable selection of the proper press equipment, and the software can estimate the cost of production. The software automatically retrieves cost-related job details from the CAD environment and calculates a price quote, with the quote printed in a professional format including embedded screenshots of the preliminary design. CimatronE reliably imports and exports all standard CAD files and also can read and write native files of common CAD systems. The software, according to company officials, helps die designers avoid trial and error at later stages of a project, and allows for a smooth transition from strip or transfer design, through tool design, to manufacturing. CimatronE’s advanced blanking capabilities—based on FEA—are built-in, so users reportedly can create a blank accurately in a single click. With the array of technology available in these ever-improving software products, potential users must do their homework. The problem, says Ulintz, lies in the fact that these simulation codes examine whether the part can be formed in a single hit. One-step codes definitely have their place, but users must know what type of software they are getting. The bottom line, according to Ulintz: Understand the limitations and capabilities of the software, and measure those against the cost and what you need it to do. Ulintz offers additional advice: “Changing blank size,” he insists, “affects formability. You may think that one-step codes should be avoided. Not at all, according to Ulintz. Such codes provide high accuracy and rapid analysis turnaround, an ideal combination that enables software to produce accurate quotes and good part-formability data early in the product-design process. One-step codes—used during product development and process planning—assess manufacturing feasibility. Then, incremental codes provide final validation for completely defined product and process (die) designs. Due to simplifying assumptions, one-step codes compromise accuracy for the sake of time. These compromises are offset by the fact that numerous what-if scenarios can be evaluated in a matter of minutes to help identify important process parameters. Because of their speed and minimal input data, one-step codes routinely find use during product design to help establish feasible processing methods. One-step codes can provide visualized data output such as wrinkle and splitting tendencies, or approximate strain and thickness distributions induced by the forming process. The chief disadvantage of one-step codes, as Ulintz explained, is that they are restricted to a single, one-step forming operation. That said, these codes offer the best solution during product development, as very little input is required and rapid analysis turnaround means little delay in the product-design phase. You could certainly see your skills in the work you write. The world hopes for more passionate writers like you who aren't afraid to say how they believe. All the time go after your heart.